Albert Squares are the next instalment in my Edmonds challenge series, following Afghan Biscuits in the index section of the Edmonds Cookbook. Although not strictly – there is an entry for Afghan Slice hot on the heels of Afghan Biscuits. However, the recipe for Afghan Slice involves making the exact same recipe as the Afghan Biscuits, only stuffing it into a tin at the final stage rather than making biscuits, and I decided this would be a bit like cheating on my part, and possibly a little boring for you dear readers out there. Afghan Slice does of course sound delicious. So, the mighty Albert Square it is. I have to say I had never heard of this particular treat. The only Albert Square I was familiar with was a fictional one – that of the somewhat harrowing british soap EastEnders. A quick flick of the ingredients, however, and it rung a dim bell in my memory, stored somewhere with the memories of Sunday School afternoon teas and bake fairs. 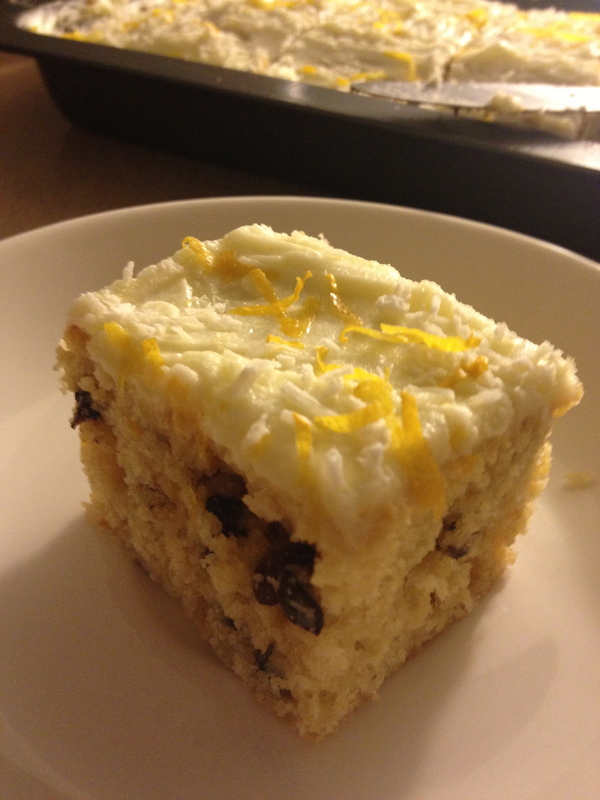 I think it’s the combination of currants and coconut that make it familiar to me; it seems that a dusting of coconut and dried fruit are integral parts of many New Zealand baking treats . I’m not sure of the history of the Albert Square, although I suspect it may a Victorian-era delicacy, with the name Albert and all (hot tip – take caution when googling ‘Prince Albert’ in pursuit of innocent baking facts). You begin by creaming the butter and sugar until light and fluffy. No further comment on creamed butter and sugar is needed from me since the Afghan Biscuits except to say I still think this stuff is delicious. Then the eggs are added, one at a time, beating well after each addition. Beat in the syrup and vanilla. 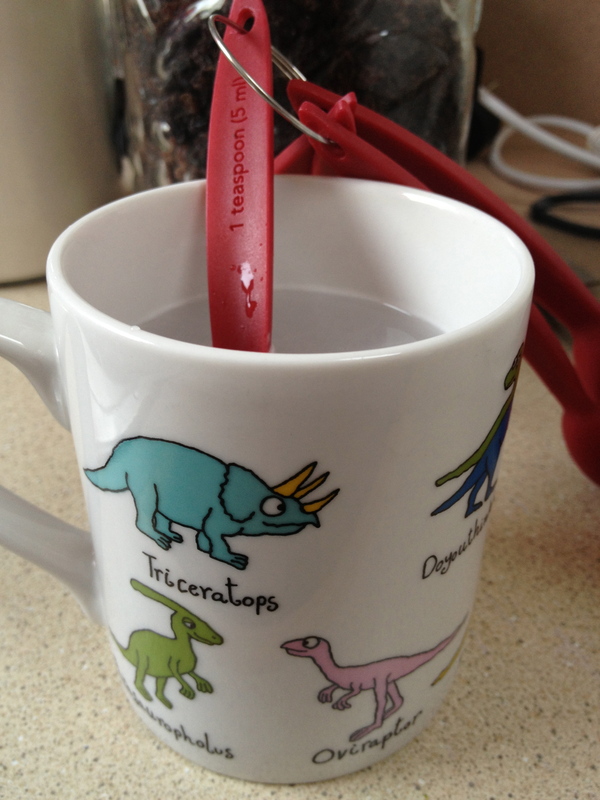 Here’s a handy tip which I like to think is my own invention, but I bet heaps of you know this one already: when dealing with sticky substances such as syrup or honey, it helps a great deal to heat the measuring apparatus before use, which I usually do by immersing in a cup of hot water. That way, the syrup slips off very easily, and you are not forced to spend extra time coaxing it off with your fingers and making a mess. Next come the currants, which are folded in. 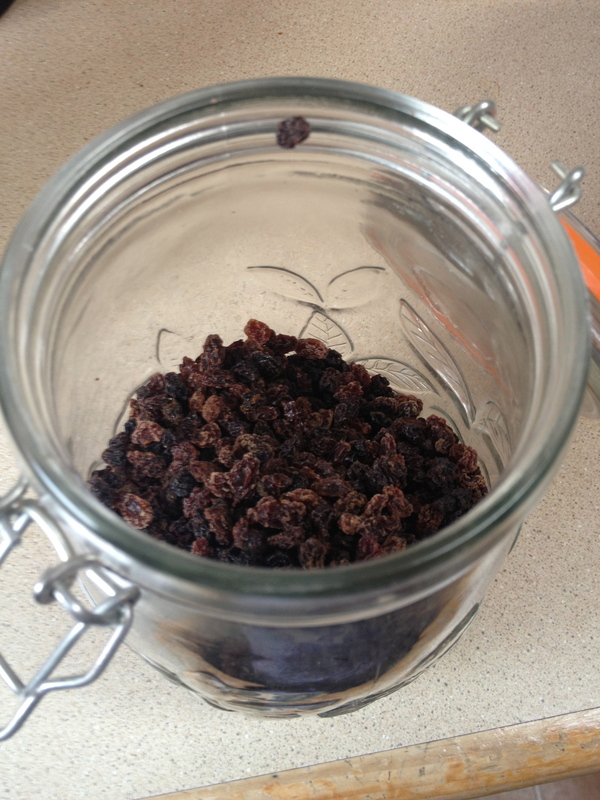 Is it just me or is it only possible to buy currants in very large quantities? I seem to have heaps of them and I only ever require small amounts perhaps twice a year. Hence I was pleased to see a cup of these little buggers are needed for Albert Squares. 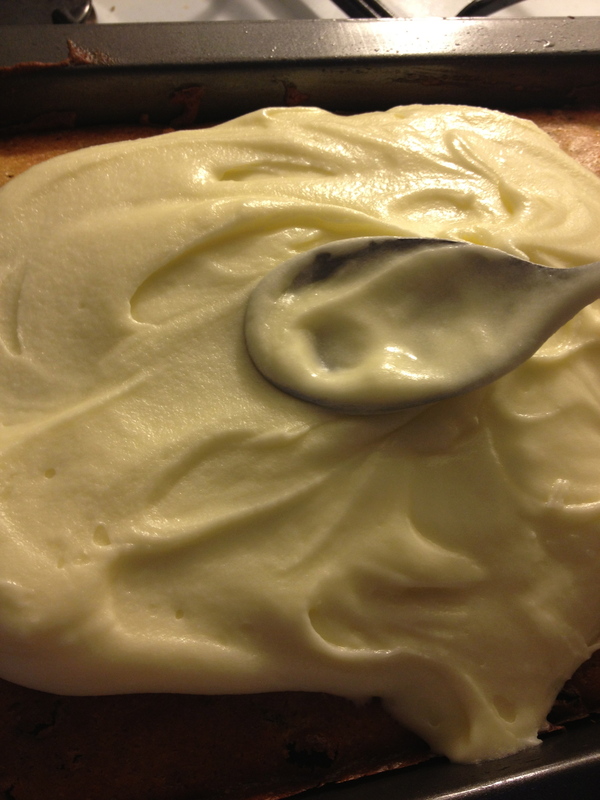 The flour, baking powder and salt are sifted together and folded into the creamed mixture, alternating with the milk. I found it made quite a stiff mixture, almost like a dough. At this point, you spread the mixture into a greased 20 x 30cm sponge roll tin and bake it at 180 degrees celsius for 30 minutes, or until the centre springs back when touched. When cold, ice it with icing made by combining 1 & 1/2 cups icing sugar, 1/2 teaspoon vanilla essence and ‘sufficient water to make a spreading consistency.’ Here’s a gratuitous icing shot, because I really love icing. Complete the look by sprinkling with 3 tablespoons of coconut and finely grated lemon rind. And there you have it. I can certainly imagine Victorian ladies enjoying this little square with a cup of tea. For myself, I must say that although it was pleasant, I probably will not experience a craving to make it again any time soon. 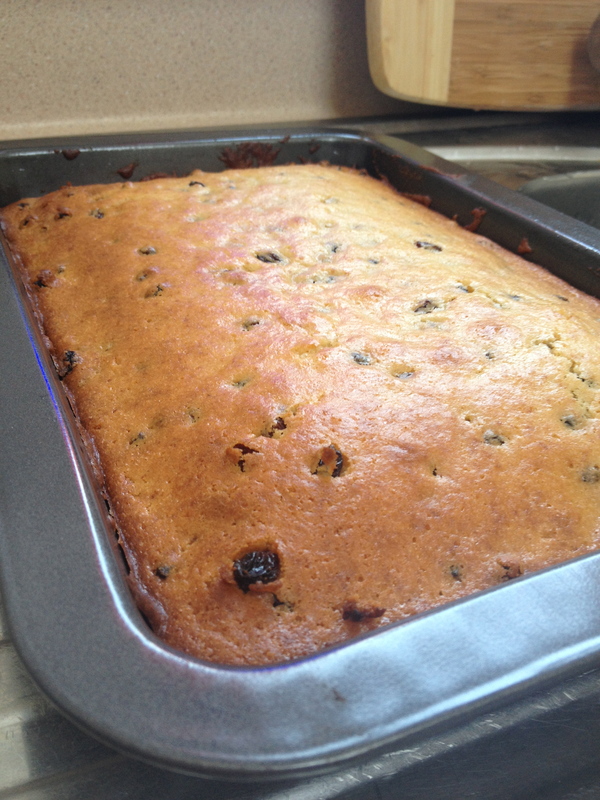 But for those who like a more solid, cakey slice with a touch of dried fruit, this would fit the bill. Yeah, it was a little stodgy! Oh hello! These look and sound lovely. I like a bit of stodge and any kind of square like this reminds me of my granny. We Northern Irish folk love these kind of ‘traybakes’. Hello! Oh, thank you, these squares remind me of my granny too. I have not sampled a Northern Irish tray bake! But, if they are anywhere near as great as a jammy doughnut, I’m well in. I’m back! I’ve missed you! Come find me on my new website….